Haley Scott DeMaria, the 1995 Notre Dame alumna who made an inspiring recovery from critical injuries suffered in a tragic 1992 bus accident involving the Fighting Irish swimming team, urged the class of 2012 to embrace a life of gratitude and challenged the graduates to celebrate the blessings of their lives, even during the darkest times, at the 167th University Commencement Ceremony on May 20. Michael J. O’Brien, a political science major from St. Charles, Ill., delivered the valedictory address, and the Laetare Medal was awarded to Ken Hackett, former president of Catholic Relief Services (CRS). The University announced new doctoral programs in sacred music and anthropology. Groundbreaking ceremonies were held on June 15 for the Notre Dame Linked Experimental Ecosystem Facility (ND LEEF), a research facility that is a partnership between the University and St. Joseph County Parks. The field-based environmental research facility will allow Notre Dame scientists, graduate and undergraduate researchers, visiting scholars and other academic institutions to study the interrelationships of land, water and wetland ecologies in the face of environmental change. 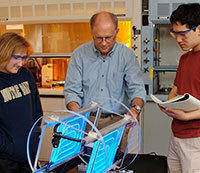 In collaboration with corporate partners and local community organizations, the University of Notre Dame offered a pilot Innovative Thinkers Camp for two weeks this summer to encourage local youth to pursue individual achievement in academics and areas of future career interests. Participating Notre Dame departments were Community Relations at ND Downtown, the Hesburgh Libraries, Multicultural Student Programs and Services, TRiO and the Robinson Community Learning Center. The top-ranked and undefeated Notre Dame football team will take on Alabama in the BCS Title Game Jan. 7, 2013, at Sun Life Stadium in Miami. For Notre Dame, it marks the first time any institution has been ranked No. 1 in the NCAA Graduation Success Rate football standings (at 97 percent) and also played in the BCS Championship Game. Meanwhile, Notre Dame graduated 99 percent of its student athletes in all sports — the top figure for the sixth straight year. 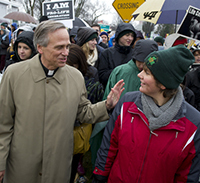 Father Jenkins joined some 350 students, faculty and staff from the University who traveled to Washington, D.C., on Jan. 23 to take part in the 2012 March for Life. The annual march, which marks the anniversary of the Supreme Court’s 1973 Roe v. Wade decision legalizing abortion, has drawn increasing numbers of people over the years, and this year, the 39th anniversary of the decision, Notre Dame’s was among the largest march contingents from any college or university in the country.